1995 Mustang - GT -Cobra R - Boss Shinoda and more. The 1995 Mustang production was a mix of new and old. Ford's new base cars had virtually identical specifications when compared with the 1994 models. the production of the 1992 model year. The 1995 Mustang was again available as a 2 door coupe or a 2 door convertible. A GT coupe and a GT convertible was available and the Ford special vehicles team produced a very potent SVT Mustang Cobra, with a 5.0 Liter V8 which produced 240 horse power. Named after Ford's Larry Shinoda, came the wild looking Mustang Boss Shinoda. Shinoda, was responsible for designing, not only the 1963 Corvette and 73 Z-28 Mustang, but the original Boss 302 and Boss 429 Mustangs. 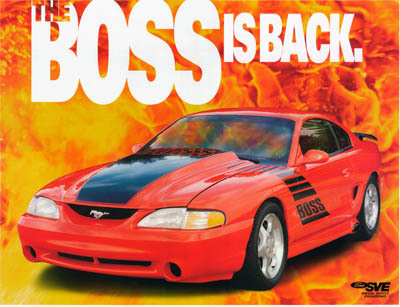 The 95 Boss Mustang came equipped with special ground effects and some throwback Boss 302 style stripes and hood treatment. Although the base body work was basically unchanged from the 94 model, the real changes came in the form of a GTS model, which was only available as a 2 door coupe equipped like a GT, but missing the distinctive bumper mounted fog lamps and rear deck lid spoiler. In my judgment, this was really a poor man's 1995 Mustang GT and the GTS price of $16,910 versus $18,105 for the full GT package,seems to bear this out. The car also featured the pony alloy wheels,rather than the 5 spoke GT rims. The potent SVT Cobra R was easily distinguished by a new fiber glass hood with a necessary double hump hood bulge and the small svt logo at the rear. And it only came in white. The Cobra R front end fascia replaced the GT fog lights with real functioning vents, designed to send air to the front brakes aiding cooling and lessening brake fade. The standard 1995 Mustang interior was unchanged from 94, and the new GTS model sported the standard V6 interior options, rather than the upgraded GT interior, except for the GT's 150 mph speedometer. The engine compartment is where things get more interesting for the 95 vintage. 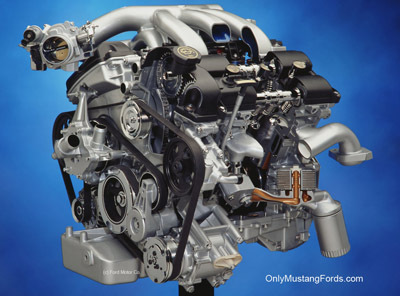 The biggest news was the 5.8 liter (351 cubic inches) V8 used in the SVT Cobra R, Using the now highly sought after GT40 cylinder heads and mated to a beefed up Tremec 5 speed, it produced 300 horsepower and 365 pounds of torque at a low 3,750 rpm. The "standard" Cobra featured the venerable 5.0 liter V8 which produced a very respectable 240 horse power. Also available was the base 3.8 liter V6 with its 145 horsepower unchanged for 95 and the other 5.0 liter V8 offering, which continued to be offered with 215 hp. Some other important details further distinguished the Cobra R which made it not just a styling or trim group offering from FoMoCo. First there was a limited production of only 250 cars and all came equipped with a heavy duty radiator and oil cooler, a 20 gallon fuel safe fuel tank and a heavier duty suspension equipped with Koni shocks, Eibach springs and a beefy 30 mm anti-sway bar. Like an early early Shelby Mustang Cobra, the car was put on a weight reduction diet including deleting the rear seats, power windows, sound deadening insulation and the heavy, horse power consuming a/c unit. Unfortunately the addition of the new race ready parts and the 351 motor resulted in only a 200 lb overall weight reduction. But that wasn't the point, so much as building a car that could stand up to the rigors of real racing, because in order to buy one of these rare beasts, you had to own a genuine NHRA (National Hot Rod Association) or SCCA (Sports Car Club of America) license. Here's a recent question from a visitor, wanting to know about the pros and cons if he were to change the engine computer from a 1995 unit to an earlier model.